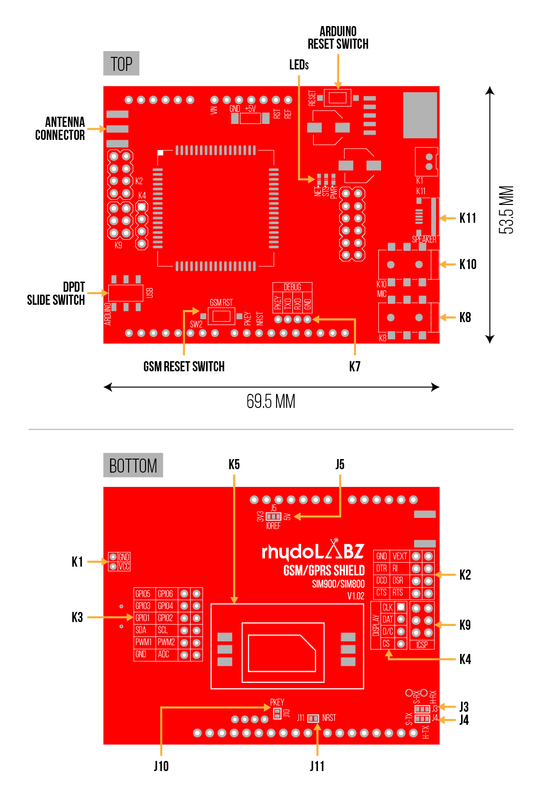 Introducing rhydoLABZ GSM/GPRS Shield, an all-in-one cellular shield that lets you add voice, text/SMS, data and bluetooth* connectivity to your arduino project in an easy to use pluggable shield. This cellular shield from rhydoLABZ is available as three different variants, built with different cellular engines (SIM900, SIM900A and SIM800). All of these are identical in features except that the SIM900 and the SIM800 are quadband versions (operates in 850/900/1800/1900 MHz), while SIM900A is the dualband version (operates in 900/1800 MHz) . And additionally SIM800 has an added features, bluetooth connectivity. All the three variants are pretty much identical in its formfactor and design. These fits on top of any classic Arduino or compatible, and packs a surprising amount of technology into it’s little frame. The GSM/GPRS Modem is having internal TCP/IP stack to enable you to connect with internet via GPRS. The shield is manufactured with Automatic Pick and place machine to meet the high quality standards. On its own, this shield can’t do anything. It requires a microcontroller like an Arduino to drive it! Additionally a SIM Card with cellular connectivity! The shield can be powered either via Arduino or directly over RMC connector. It comes presoldered with 3.5mm jack for audio out as well as mic in. You can grab some stacking headers from our store, if you would like to stack a shield on top. SIM800 modules are upgraded version of its previous successful GSM/GPRS/GPRS module series SIM900. There are multiple sub versions of each series, each of which cater to a different set of users and applications. SIM900 comes in the form of full version Quad band SIM900 & dual band version SIM900A. SIM800 itself is the full version Quad band SIM800. There are other SIM800 & SIM900 versions but very less information available about them, so they have not been discussed. What extra does SIM800 modules give me compared to SIM900 series modules? SIM800 GSM modules have a inbuilt Bluetooth stack, accessible using AT commands. SIM900 and SIM900A modules operate from 3.2V to 4.8V supply range while SIM800 modem operates from 3.4V to 4.4V supply range (Reduced operating range!). Same AT commands used for simple call/sms functionality in SIM900, SIM900A can be used with the SIM800, but SIM800 series have added AT command set for supporting extra features like bluetooth. SIM800 module is needed only if you need those additional features that are not present in SIM900 series modules, like the Bluetooth functionality which was missing in SIM900 series. SIM800 and SIM900 can be operated worldwide because they can operate in all four GSM bands used across the world. PWRKEY pin of GSM modem is to turn modem On/Off externally using open collector transistor or switch. You can turn on/off the modem alternately by driving the PWRKEY to a low level voltage for a short time (2-3 sec) and then release. This pin is pulled up to 2.9V in the GSM Modem. In the shield, it is connected to digital pin 9 of Arduino via jumper J10. Shorting the jumper and removing R16 from board enables you to power on /off the modem by Arduino. RST pin of GSM modem is active low. In the shield, it is connected to digital pin 10 of Arduino via jumper J11. Short J11 and make the pin 10 HIGH to reset the modem. The Shield contains two audio stereo jacks on board. The first is the audio input jack (labeled “MIC”). This allows you to input audio from any device such as an MP3 player, or cellular phone using a basic audio cable. The second audio jack is the audio output, labeled “SPEAKER”. This jack allows you to route the audio out to a speaker. Lets check out on getting started with this shield on Arduino. Insert an activated SIM Card to the SIM Socket (K5), provided on the bottom side of the shield. Having familiarized with the shield, now its time to use it for practical applications. What would be the first thing you want to do with it? Send out a text (SMS)? All of these can be done using the AT Commands – mother tongue for cellular modules. These are simple textual commands sent to the modem over its serial interface, which makes it easy to communicate with the modem over any serial terminal software. Now open up the Arduino serial monitor with the com port connected to Arduino and baud rate set as 9600. Start sending AT commands over the serial monitor to communicate with the shield, and you will get back the response from the shield. Make sure to add up carriage return while sending commands. If you are using the shield over the hardware uart pins, then you could use the below given code on your Uno to send out a test message. *NOTE: Kindly note that the quad band variants of the shield comes with SIM900 and SIM800, whereas SIM900A is the dualband version. The Bluetooth functionality and USB debug features are available on the SIM800 variant only. Certain features such as display interface, PWM output etc requires customization of the firmware. 30 Responses to "How to interface GSM/GPRS Shield (SIM900A/SIM900/SIM800) To an Arduino"
The purpose of these jumpers are to switch between the hardware uart & software uart(7-tx & 8-rx). If the sample code is not working with your board, we strongly recommend checking those jumpers. The sample code is developed for boards configured for software uart. jumpers?? is it a toggle switch?? The DPDT switch is used for selecting shield in USB or Arduino(RX,TX) mode. There are two jumpers J3 and J4, by shorting the jumpers to S-Tx and S-Rx the shield work in soft uart and if we short to H-Tx and H-Rx it work in hardware uart. Can we upload firmware to the arduino with the shield inserted? If yes then which position of the dpdt slide switch would be better,Arduino or USB? Also,would it make sense to keep the GSM reset switch pressed when uploading code to the arduino? In the GSM shield, four debug pins will be listed out in the board, feel free to use those pins for the firmware modification. Please refer the below link for details regarding the firmware updation. I think he is asking whether he can upload code to Arduino with GSM Shield inserted on arduino. I want to know the function of DPDT switch available on the GSM shield. Adjust the DPDT slide switch as desired (USB – to communicate with the PC directly without an ATmega328 on your Uno, Arduino – to communicate with the ATmega328 on your Uno). So you can upload code to Arduino with GSM Shield inserted on arduino board just by sliding DPDT switch to USB position. i buy a gsm 800 shield , i am not able to see j3 and j4 jumper. kindly guide how to use. Jumper J3 and J4 are used for switching the serial communication between the Hardware serial and Software serial. Hardware serial is default serial communication in arduino,ie Digital pin 0 and 1 are used for communication(D0 as Rx pin and D1 as Tx). For software serial digital pin 7 and 8 are used for communication(D8 as Rx pin and D7 as Tx pin). J3 is used for switching between S-RX(software Rx) and H-RX(Hardware Rx). J4 is used for switching between S-TX(software Tx) and H-TX(Hardware Tx). Instead of stacking it on Arduino, how to power up this module using RMC Connector?? What are the necessary equipments we need to buy?? I am new to this field, so your assistance could be valuable. K1 is the RMC connector for giving power supply to the module instead of stacking it on arduino. A 2 pin RMC male connector is provided in the shield and package includes a 2 wire female RMC cable. 7-12V from a 0-30V/2A DC power supply can be used to power up module. 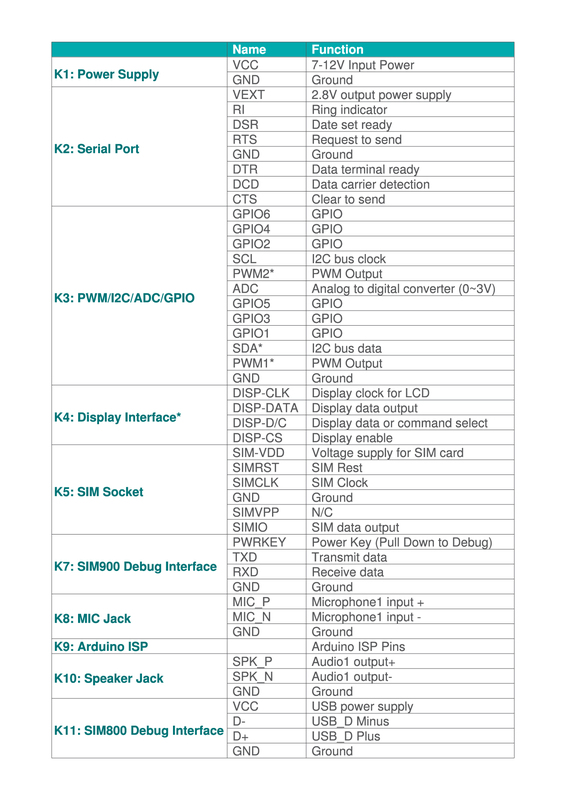 To interface Arduino with GSM shield kindly do the following steps. NB: It is strongly recommended to use a stand-alone 2A power adapter, because the PC’s USB port might have not enough power to support the Arduino and GSM modem. Will the SIM900A module work in the North African countries without issues? SIM900A is a dual band GSM modem being able to operate only in 900,1800 MHz bands & SIM900A can only be used in Asia, as it is region locked to Asian markets. How can I Connect 2.8inch touch tft screen shield from wave share and this gsm module shield toghther with Arduino uno..I bought all three from Rhydolabz only. I was wondering what is the difference between the gsm/gprs module and the gprs shield module. And as stated on the site the sim900a module works only in asia. What about the 900 module? I live in us , does the sim900 module works in us? Any information on this or any help is greatly appreciated. SIM900 is a Quad band device which operates in 850/900/1800/1900 MHz that works everywhere, while SIM900A is the Dual band version which operates in 900/1800 MHz and is regionally restricted & SIM900A can only be used in Asia, as it is region locked to Asian markets. GSM/GPRS module is something that you can connect( interface) data, add voice, txt msg with the arduino using standard jumper cables. GPRS Shield, an all-in-one cellular shield that sits on the arduino and quite literally shield it. I purchased sim 800 shield and Uno board from rhydolabz. I want to to connect sim 800 shield and uno board without stacking it on uno board. But i don’t know where Tx and Rx are present in Sim 800 shield. 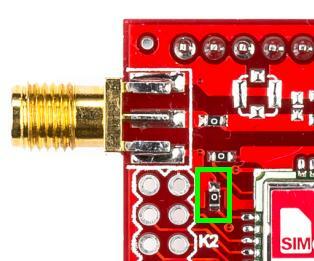 The TX and RX pin of sim800 shield is in the 1st and 2nd pin (digital side) of the shield respectively. Will the module I.e GSM stacked on arduino send values when powered independently with no connection with pc through serial port. Yes,We can establish communication without connecting to PC by powering through adaptor or power supply(Communication as per the program uploaded). Hi, I set up GSM SIM900A on top of the Arduino board, but i failed to invoke the SIM900A shield through the Arduino IDE or AT Command tester. My shield is not responding, I tried different programs not no use. The following result got from AT Command tester. Please help me out. Invalid or no response from the device. Please check the modem port and the baud rate.Disconnecting port COM4. Use 9600 as baud rate.If you are using any terminal software put the DPDT switch in USB.